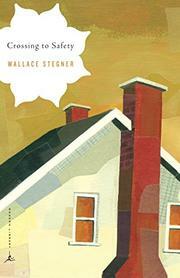 Stegner takes a long look back--at four decades of a foursome's life--in a novel that at moments is beguiling, though at others it labors for its theme. Larry Morgan and his wife Sally are young westerners who, one day in Depression-poor 1937, arrive in Madison, Wisconsin, where Larry is to take a one-year teaching post at the University of Wisconsin. Their lives are charmed and transformed when they become friends with Charity and Sid Lang, rich easterners whom the star-struck Morgans take to be the epitome of privilege, grace, and culture. A bosom friendship is formed between the two couples that is to last a lifetime, although that lifetime itself isn't to turn out as ideally as hoped. Success as a writer comes early to Larry Morgan, but his wife Sally is stricken by polio and made permanently a cripple. The elegant Sid Lang, meanwhile, is fired from his post at Madison, with the result that he and Charity (with children) are forced into retreat in the family's Kennedy-esque estate at Battell Pond, Vermont. There they wait out the years of WW II, and there it becomes increasingly clear (in the best sections of the book, which are rich, sure in tone, and reminiscent of, say, the reverberant delicacies of The Good Soldier) that the good Sid is in reality a weak and intellectually hapless man, and that wife Charity is in fact ruthlessly class-driven and relentlessly domineering. The novel ends in 1972, with a macabre reunion of the four friends in Vermont, as Charity orchestrates her own death (of cancer), compelling the others, in their varyingly crippled or exhausted states, to behave in the ways she sees as order-affirming and proper. Widely ambitious, the novel brings vividly to life certain quintessential moments and ideas--the idealistic moment between the Depression and WW II; the poetry-and-backpack rigor of the old New England intelligentsia. But Stegner clings to his theme of undying friendship beyond the point where his material keeps it alive, leading him to an often visibly artificial and conventionalized effort to push things along to their end. In all, less moving as a whole piece than highly remarkable for the fine penetration and achievement of some of its moments.